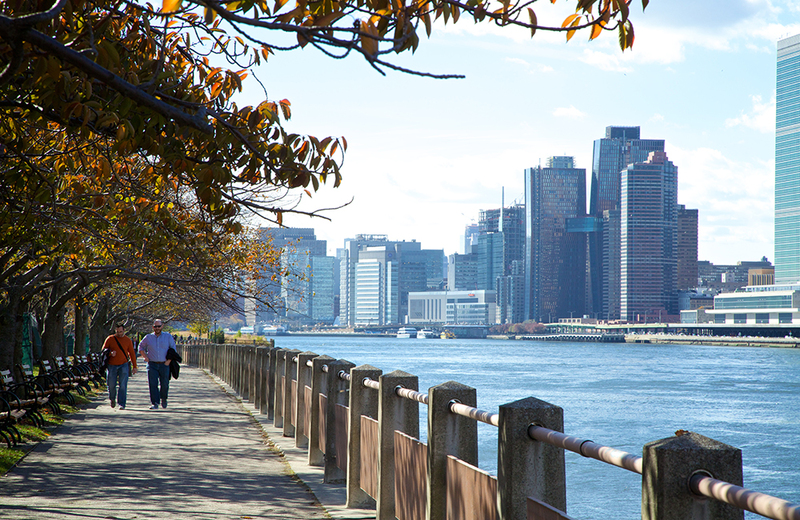 At just under two miles long and 787 feet wide, Roosevelt Island is a pedestrian paradise with fantastic views of the Manhattan skyline, miles of wide sidewalks, and plenty of parks to traverse. It’s also home to several forward-thinking projects from the 20th century and now the transformative Cornell Tech campus. The history and people of Roosevelt island are the perfect complement to the university’s goals of being tech driven, outward facing, and community oriented. “We were big advocates for the Roosevelt Island site for Cornell Tech because it was within walking distance to mass transit and had reasonable transportation time to major hubs within the city,” said Colin Koop, New York design director at Skidmore, Owings & Merrill (SOM). Koop frames Roosevelt Island as something of a paradox — a visually familiar part of the New York City landscape, yet historically frequented only by those with long term healthcare needs; a stone’s throw from the glittering metropolis, the place is yet an island unto itself. In the pre-World War II period up until the 1950s, Roosevelt Island was a place where few went. The land was the location of the Goldwater Hospital, a revolutionary building for its time, as it was designed for chronically ill patients. Furthermore, for many the island became a symbol of modern medicine, where potential patients weren’t turned away because they couldn’t afford care. In the 1960s, Roosevelt Island entered into a second phase: the staging ground for a modern utopian movement. But the sense of isolation remained — this wave of inhabitants would be similarly cut off from the life of the city, from whose unpleasantries, like crime and pollution, they sought escape. Because the land on the island is so open and walkable, the third phase revolves around the idea that Cornell Tech’s campus should both preserve, and extend, that experience with its design—and thereby give anyone who wants to explore an invitation to do so. To create such an open and inviting space, SOM reestablished a central “spine,” or pathway, allowing the public to uninterruptedly walk the length of the island. The firm also opened a network of green space that extends out to the water’s edge and allows pedestrians to flow inward toward that central spine — quite the opposite of a walled courtyard. Plus, as the template for an innovative campus, the design has far-reaching implications, according to Koop. In partnership with the city, Cornell Tech committed to making a percentage of the campus a privately owned public space.